Nothing can stop the power of a mind unchained. This all-new character deck features three new occult-themed characters who train their brains to warp the world around them: the medium Erasmus, the occultist Mavaro, and the kineticist Yoon. This 109-card accessory for the Pathfinder Adventure Card Game lets you unleash your mental fury in a torrent of mindfire. Use in any Pathfinder Adventure Card Game Bade Set. This deck is not a standalone game. 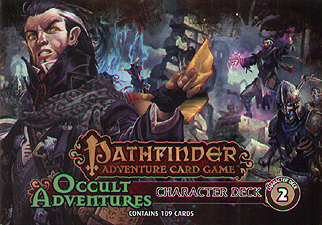 It is an accessory for use wit any Pathfinder Adventure Card Game Base Set.